Sometimes we have no idea how far the impact of our kindness will travel. When people receive kindness, they feel prompted to pass it on. 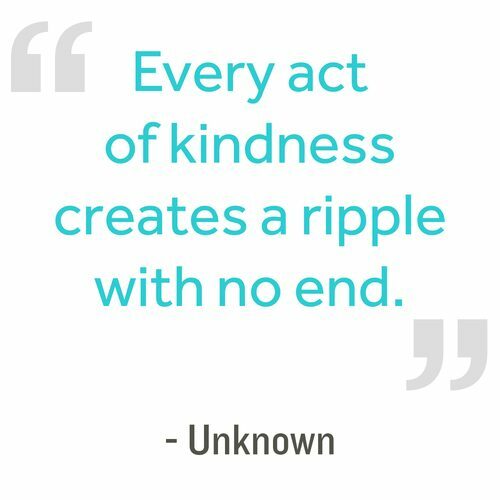 We see the ripples that kindness can have as we share it and inspire others to do the same. Many years ago when my friend and his wife had a baby, people in their Church brought them meals every day for a few weeks after the birth. It had such an impact on them that they decided to do the same for a work colleague and his wife when they had a baby. He didn’t think much more about this until he received a message from his old colleague last week. The message said that a friend of this colleague had recently lost a close family member. Inspired by the memory of the kindness he had been shown, he and his wife had decided to make meals for their bereaved friend. The colleague just wanted to let my friend know how his kind act years before had inspired them to act in the same way. Perhaps you have a memory of something kind someone has done for you? Take a moment to consider how that affected you and how you could pass that kindness on to someone else. 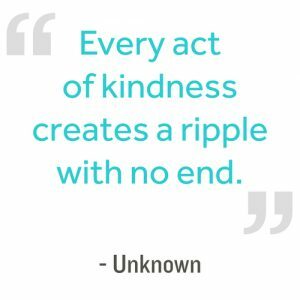 Perhaps you could start a ripple effect of kindness – as it goes out from us it can spread further and wider than we can see. Every act of kindness you receive can be an inspiration to pass it on. There is something wonderful about being a trigger for blessing in someone else’s life. If someone you know is going through a difficult time it can have an especially big impact. Look for ways you can start that ripple effect today!